Guest blogger Gail Sachson find’s the Undermain’s recent production confusing – in the best way. Guest blogger Gail Sachson , former Chair of the Cultural Affairs Commission, owns Ask Me about Art, offering lectures, tours and program planning. 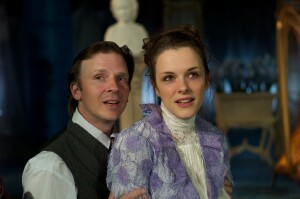 The ghosts in August Strindberg’s Ghost Sonata, directed by Patrick Kelly and presented at Undermain Theatre through May 11th, aren’t all on the stage. They are within us all. They are the ghosts of our Mothers, our Fathers and ourselves. Often referred to as a dream, Ghost Sonata ,with all the inconsistencies and absurdities of a dream, is more like a nightmare. Yet it is a nightmare from which the sleeper/theater-goer awakens not with a scream, but with a sense of redemption, able to see the truth. That truth: the lives we lead, filled with fraud, falsehoods, meaningless conversation, cheating and miserliness, will end in a life “sucked of strength,” and we will die a slow death behind a dying screen. The timeless themes of who cheated on who, who bilked who out of money, whose marriages went sour and who hid their identities are all dreamlike pop-in/pop-out details , which you can force yourself to remember. Or you can concentrate more on the superb theatrical talent, the lyrical quality, the staging and the creative scenic design, including the mandala painted floor, which heightens the theme of no escape. If this all seems seems confusing, it is supposed to be. If I tell you more about the curtain, the ghost, the mummy (Did I mention the mummy? ), the dinner party (Every meaningful theater production seems to involve a dinner party), the symbolism of the hyacinth, the truth about the flickering light, or let you read the comprehensive notes provided by the theater’s literary department, I would take the fun away. After all, ART is supposed to confuse.